Most people really only give much consideration to Irish soda bread on St. Patrick’s Day and may not think about it much the rest of the year. The problem is that most of the soda bread you find in local stores this time of year is very dense, very dry and very crumbly and just does not taste that good. 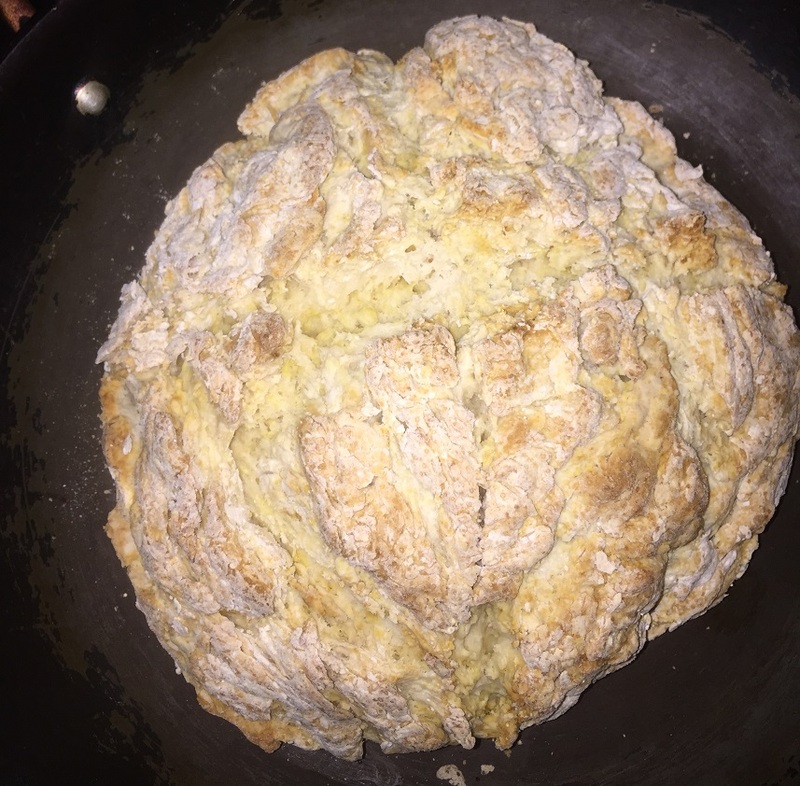 Even some of the mixes I have tried over the years have been disappointing and I wanted to try to make one this year that would have the great crust a soda bread should have but the tender bread that was not tough to eat. I came across this recipe from America’s Test Kitchen last week and it was simple, basic and sounded perfect so I went about giving it a try to see how the bread would be. Heat the oven to 400 degrees and adjust an oven rack to the center position. Place the all-purpose flour, cake flour, baking soda, cream of tartar, salt and sugar in a large mixing bowl. Add the butter and rub it into the flour using your fingers until it is completely incorporated and the mixture resembles coarse crumbs. Make a well in the center of the mixture and add the buttermilk. Work the liquid into the flour mixture using a fork until the dough comes together in large clumps. Turn the dough onto a work surface and knead it gently and briefly until the loose flour is just moistened. The dough will still be scrappy and uneven. Form the dough into a round about 6 to 7 inches in diameter and place it in a cast iron skillet. Score a deep cross on top of the loaf and place it in the heated oven. Bake the bread until it is nicely browned and a tester comes out clean when inserted into the center of the loaf, about 40 to 45 minutes. Remove the skillet from the oven and brush the top of the loaf with the tablespoon of melted butter, if desired. Cool the bread for at least 30 minutes before slicing it. Serve the bread slightly warm or at room temperature. I have to say it was the best soda bread I have had in a long time. No it does have raisins, or currants or any of that other stuff in it, but it doesn’t need all of that and that is more of the American version of Irish soda bread anyway. The crust on this bread has a wonderful crunch to it just like you want without it being all crumbly so it doesn’t fall apart when you slice it. The bread itself is nice and tender as well and goes really well with your corned beef and cabbage meal, if that is what you are having. You can make this on a baking sheet if you don’t have a coast iron pan or want to use one, but I think the crust comes out great thanks to the cast iron pan. If you can eat it while it is still warm it is that much better, but this will be okay for a day or two covered before it starts to dry out if you want to make it ahead of time. This will be my go to soda bread recipe from now on.